Women are often overlooked, in every professional field imaginable, and moonshining is no different. The first thing people think of when talking about moonshine stills are old men in the hills, with gray beards halfway down to their feet. And unlike your local mini-mart, shirt and shoes are optional. Like every man, and like so many women today, getting into the moonshine business is what many women had to do to get by. Truth be told, hardworking ladies have been bootlegging for hundreds of years, even when doing so could have gotten them arrested for witchcraft. If the liquor only made people drunk, no problem. If it killed somebody or blinded them, “mama’s workin’ for the devil!” It’s easy to forget how hard life could be years ago. We get all the romanticized versions of the past, where everything is always a fun and exciting adventure. Even when things are bad in the movies, it’s only to make a better contrast for when things miraculously turn around. In real life, the good old days consisted of backbreaking labor, and if you had enough food to eat at sundown, and no one got cholera, it was a good day. So, when the man of the house died, it fell to the woman to fill both roles and keep things going. Many women like Nora Gallagher were just trying to survive and provide for their youngins, or buy fancy Easter clothes, depending on who you ask. Many set up shop in what became known as home speaks (work from home speakeasies), and would mix it in with their legitimate jobs. One effective trick was to use a home laundry service to smuggle pints and gallons of whisky. Women made some of the best smugglers. Cops weren’t allowed to search most women, since it would be impolite, and definitely not be allowed to check anything near the delicate lady bits. A woman could smuggle bottles under her dress, and there was nothing law enforcement could do about it, in many places. Just having a woman in the car or driving a truck alone was often enough to keep nosey agents from searching for booze. Some more enterprising ladies turned illegal distilling into million dollar businesses. 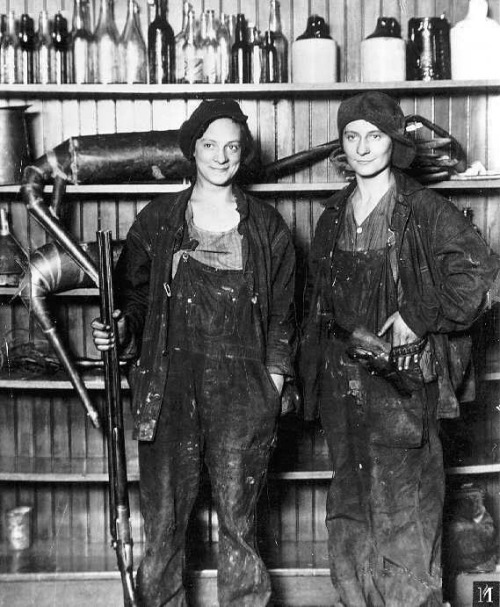 These women were often called Queen of the Bootleggers, whether they got caught or not. People knew who was in charge and there sure was a lot of Queens out there. Some of them lived lives of glamour that sound more like a movie plot than a criminal enterprise. Gertrude “Cleo” Lythgoe, a beautiful and powerful woman made of steel and confidence, brought in millions smuggling booze from the Bahamas to the US. She eventually got caught, turned state’s evidence, and lived a nice comfortable life for the rest of her years. Not a bad life to live.